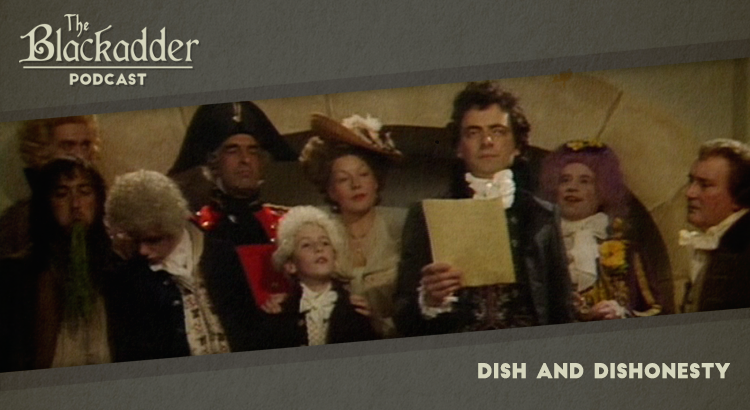 Dish and Dishonesty was the first episode of Blackadder the Third and features political shenanigans of the highest order. In this podcast Gerry and Iain consider a rotten borough and the ennoblement of a most unlikely Lord. For the first episode of Blackadder the Third, series regulars Rowan Atkinson (Mr E Blackadder) and Tony Robinson (Baldrick) returned in familiar, if slightly different, roles while a new regular character was introduced in the shape of Hugh Lawrie‘s Prince Regent. Helen Atkinson Wood appeared for the first time as Mrs Miggins, while there were guest roles for Geoffrey McGivern (Ivor Biggun), Simon Osborne (Pitt the Younger), BBC presenter Vincent Hanna (his own great-great-great grandfather), Denis Lill (Sir Talbot Buxomley MP) and Dominic Martelli (Pitt the Even Younger). Blackadder the Third was written by Ben Elton and Richard Curtis and all six episodes were directed by the returning Mandie Fletcher. Once again, John Lloyd produced the series and Howard Goodall was responsible for the music. Dish and Dishonesty was released in 1987. It is 29 minutes long and originally aired on the BBC. Blackadder the Third is sadly not available on Netflix, but a remastered set of the whole series is available on DVD around the world (Region 1) (Region 2).